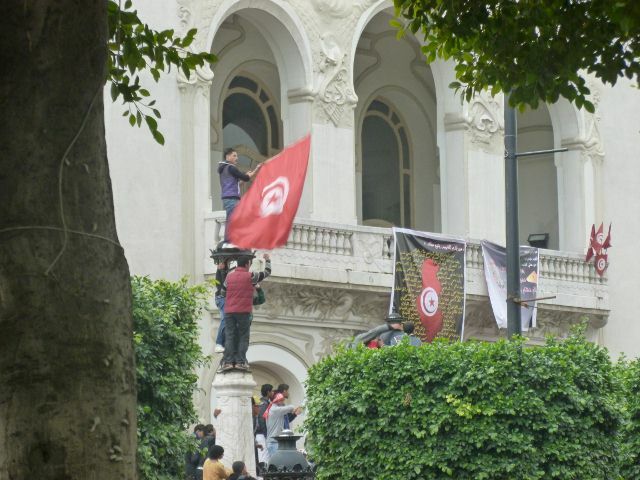 Some photos from yesterday’s happenings on Avenue Bourguiba in downtown Tunis in commemoration of the one year anniversary since Ben Ali’s departure. 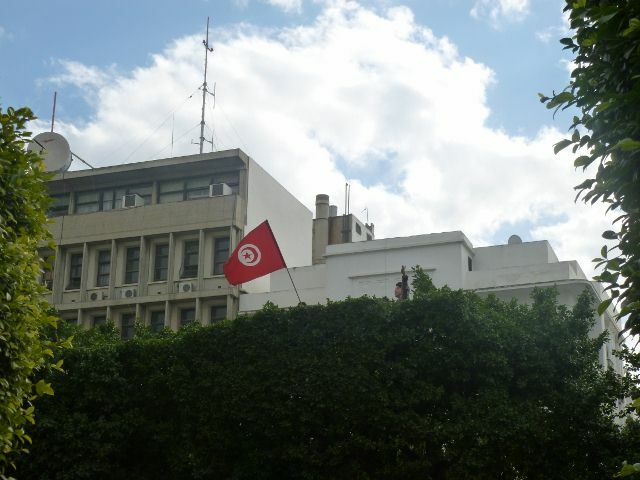 Reports say that up to 20,000 people took to downtown Tunis, many to celebrate, many to demonstrate that the revolution is not yet over. 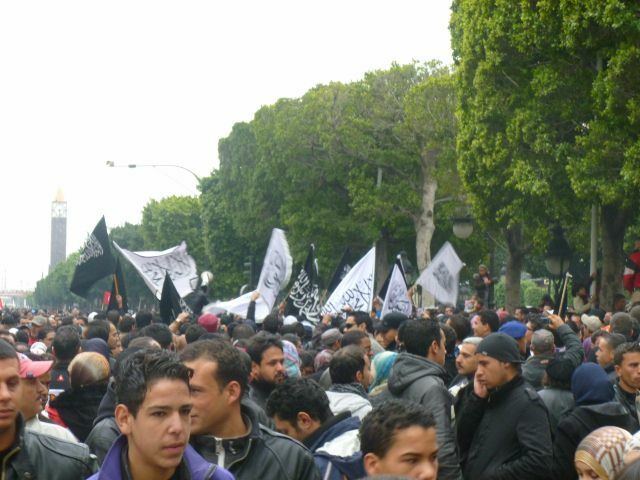 Ennahdha supporters were well numbered, as were Salafi groups, waiving their typical black and white flags, as well as communists and union members. I heard protesters chanting for all sorts of causes – for the return of the caliphate, for human rights, and for Bashar Assad’s degagement. 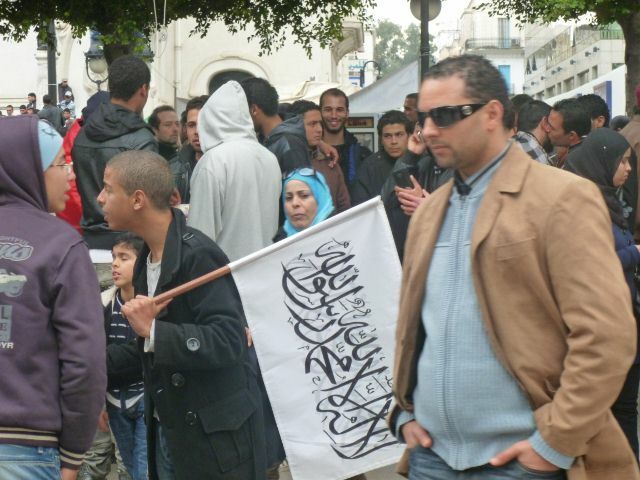 In addition to writing about the impact of Mohammed Bouazizi on the occasion of his tragic self immolation, I thought it would be intersesting to explore the evolution of Tunisian propaganda as it became increasingly unable to deal with the growing protests. I have used the main Tunisian French daily, La Presse to show how the message changed from December 17 to January 14 – a month of protests that changed the course of Tunisian history. La Presse is Tunisia’s oldest French language newspaper (founded in 1936). It is linked closely with the government. Under Ben Ali, as with all media in the country, they were closely monitored and censored by the government. On this date, Mohammed Bouazizi self immolated in his hometown of Sidi Bouzid in southern Tunisia. La Presse, unaware as everyone else of what would transpire that day in Sidi Bouzid, leads with a story on Ben Ali’s visit with Hamad ibn Khalifa al Thani, and furthering Qatar-Tunisia relations. The irony is unmistakable as Qatar has emerged as a key supporter of Arab revolts in general, and specifically of Tunisia’s long-oppressed Islamist leaders, Ennahdha. In the following days, the press continued to float stories about the president’s plans for economic development, but it wasn’t until the December 24 that La Presse reported on actions being taken in Sidi Bouzid. This was clearly an effort to ensure that the events would stay, at least in the public’s eye, as a localized event. But by this point, the protests were already spreading. The headline reads that the regional counsel of Sidi Bouzid sends its strongest thanks to President Ben Ali. In an adjoining story, Ben Ali’s hated wife is praised for her tremendous work in support of Arab women. From the 25 until the 27, La Presse made a targeted effort to direct attention to positive work in vulnerable regions. Beginning in Kasserine (close to Sidi Bouzid) on the 25th, to Le Kef and Jendouba near Algeria in the west. 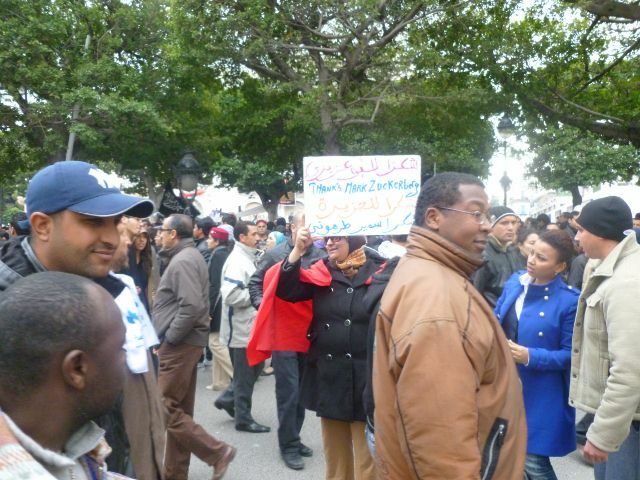 Protests had been spreading and this can be seen as another effort to cut them off before they reached the important coastal cities of Bizerte, Sousse, Sfax, and Gabes. The interior regions have long suffered form underdevelopment compared to the richer cities on the coast, which benefit from manufacturing and tourist income. By the 27th, Ben Ali was calling for decentralization of government – at the time, if it could have been taken seriously, this would have been considered a major reform. By the 30th of December, Ben Ali was forced into announcing major jobs and investment programs as well as changes in the government. On the 30th he announced a partial cabinet reshuffle, the following day he announced the replacement of several regional governors (largely hated by local populations). 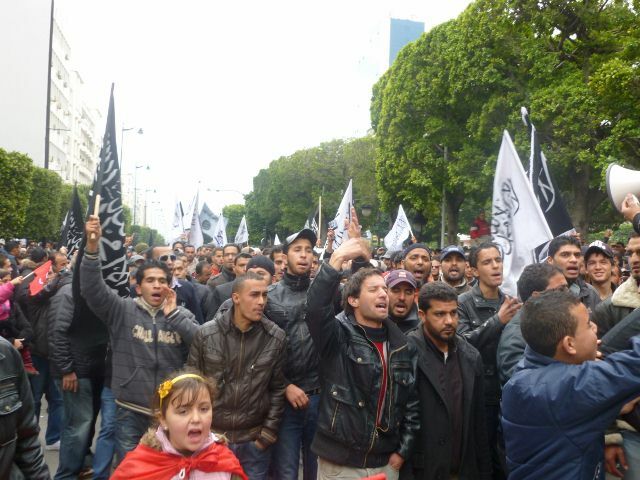 Protests had spread to all major cities, including Tunis, leading to the issue of travel warnings by foreign embassies. The U.S. issued its warning on December 30, before the protests had been reported in the local papers. The first few days of the new year the Tunisian press tried to capitalize on the new year festivities and well wishes of the president. By the 3rd, as protests continued, La Presse was in full propaganda mode. They lead with: “Le progrès est humain ou il ne l’est pas. Un principe universel adopté par la Tunisie, un pays qui avance à pas sûrs sur le chemin de l’excellence sous la sage conduite de son président.” Or in English: “Progress is human or it is not progress. A universal principle adopted by Tunisia, a country that is marches forward on its path of excellence under the wise leadership of its president.” Perhaps reinforcing Tunisia’s stability, neighboring headlines describe the conflict in Palestine and the unraveling security situation in Cote d’Ivoire. Never a strong believer in pluralism, protests had driven Ben Ali to listen to opposition parties and civil society representatives by January 7. La Presse continued its tried and true formula of touting Ben Ali as a champion of education and a promoter of jobs. In the south, the unemployed are offered 20,000 spots in a training program. 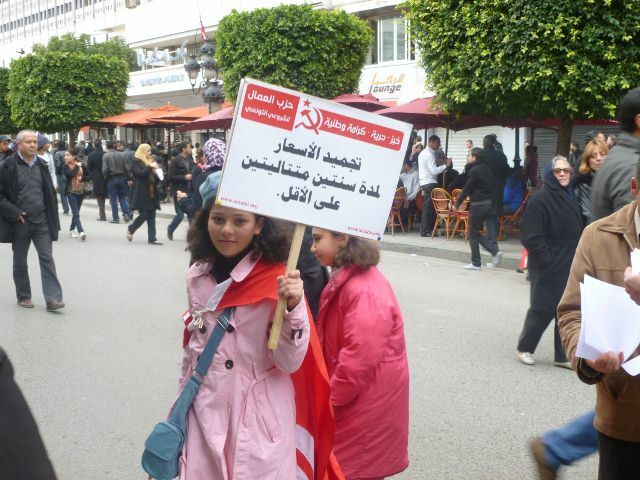 On the 8th, opposition parties, as well as youth movements, show there support for Ben Ali. At a moment when things were falling apart, these headlines perhaps show the greatest disconnect between the propaganda machine and current events. While Tunisians never held much faith in their newspapers – except for sports scores and as glass cleaner – these headlines clinched the utter madness of the regime, simply unable to respond to its people. La Presse continues to ignore the situation on the 9th with an article on the banking sector. The corruption in the banking sector had been a major source of frustration for Tunisians under Ben Ali. The middle class were often obliged to pledge loyalty to the regime before being approved for loans. And loans outstanding were used against citizens as a form of control. This aspect of Ennahdha’s platform was an underreported story from October’s elections. Their desire to implement an Islamic finance system was seen as many as a foil against the abuses of the dictatorship. By this point, the country was in full scale revolt. Foreigners had started to flee the country en masse. The entirety of the security apparatus was on the streets, with the exception of the military. Rioting and looting, and massive police violence were being reported in the foreign press, especially by AlJazeera. 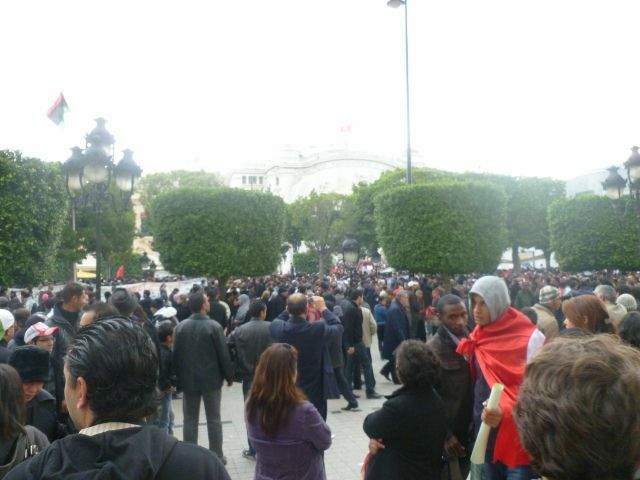 The Tunisia Scenario was being used to describe protests across the Arab world. La Press called for being civil and good citizens on the 10th. On the 11th, Ben Ali announced the creation of 300,000 new jobs. La Presse also reported that Islamism would not happen in Tunisia. By January 12 the army had been called in to quell the violence. This was seen as an extraordinary measure that would have an important impact on protecting protesters. Many Ben Ali apologists had been shocked that he had used live ammunition on protesters and by calling in the army, he was showing his humanity. La Presse reports little of substance beyond support for the regime – total satisfaction with his recent speech. A day after the army had been called in, it finally appeared in La Presse as if the government had received the message. The people were now in revolt against the police, who they blamed for Bouazizi, relentless harassment, and the use of live ammunition on peaceful protesters. In addition to mobilizing the more pacific army, Ben Ali sacked the former interior minister, replacing him with another party member. Ben Ali also called for freedom of expression – under peaceful means. The day that ended with Ben Ali leaving the country did not begin on an optimistic note. In a speech the previous night, Ben Ali spoke for the first time in Tunisian dialect, with the famous lines, “I understood you, I understood you all.” These lines headlined the issue of La Presse. In a carefully orchestrated propaganda coup, the regime had organized interior ministry minions to drive through the streets after Ben Ali’s speech to show their elation with the president’s speech – another newspaper headline screamed “National Joy!” On a personal level, after having my apartment filled with teargas, running battles down my street, and several deaths in the neighborhood alone, it didn’t quite feel like a national joy. 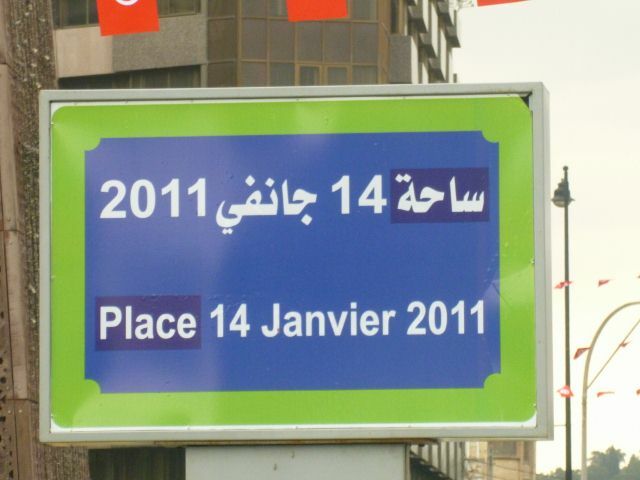 Another day of protests on the 14th would prove that Ben Ali offered too little too late. As we reflect back on the beginning of the Arab Spring, it is useful to remember the propaganda and to see how far Tunisia has come. These headlines are also a reflection of how much the Arab world has moved on from conventional propaganda pushing media. From social networks to international news channels, the traditional propaganda machines simply cannot compete with news that acknowledges the intelligence of its readers. Perhaps most telling about these headlines, is that the person who most embodies the Tunisian uprising is mentioned but once on the front page of the paper. And yet, by the end of December, he had become a household name. Sometimes the most powerful message is the one that is left unsaid. Tomorrow Tunisia will commemorate Mohammed Bouazizi, the young Tunisian fruit seller whose self immolation one year ago tomorrow sparked revolutions across the region. While myths abound (see here, and here) about Bouazizi, the origins of civil disobedience in Tunisia’s restive south, and his true motivations – he remains a powerful symbol of the price Tunisians paid during the 23 years of Ben Ali’s dictatorship. Bouazizi embodies the breakdown under Ben Ali in the relationship between the governed and the government and his story remains at the heart of Tunisia’s new experiment in democracy. I first heard of Bouazizi on New Year’s Day 2011, nearly two weeks after his immolation. I had recently arrived in Tunisia and had heard about the protests that took place in the south of the country – but had not thought too much of it. Under this deeply authoritarian regime it was a bit surprising to hear about protests, but it was not unheard of, especially in the region around Sidi Bouzid, Gafsa, and Kesserine – which have long been subject to strikes, social movements and revolts, and tribal rivalries. Not only was Bouazizi’s story shocking, my Tunisian hosts, who told me the story, had a telling reaction. My friends typified the Tunisian middle class in many ways, they concerned themselves with their work and their families, never delving into the domain of politics. They hated the Trabelsi’s and their kleptocratic ways, but they appreciated the security of Ben Ali’s regime. With two daughters, they appreciated that they were able to get a good education – one was working in France, the other in a local store. When they heard about Bouazizi they were horrified and completely sympathetic. They were also worried about the protests going on, which had by that point spread to Sousse, Ben Ali’s hometown and Tunisia’s third city. As I became more engaged in the news, it became clear that the events surrounding Bouazizi represented everything that Tunisian’s hated about the regime. Ben Ali’s visit to Bouazizi in the hospital before his death appeared only as a photo op, lacking humanity or understanding. The government’s pledge to create jobs seemed outlandish. Its declarations for regional growth were seen as little more than propaganda from the politburo. And the idea of decentralization was clearly unrealistic given Ben Ali’s highly centralized, authoritarian control structure. 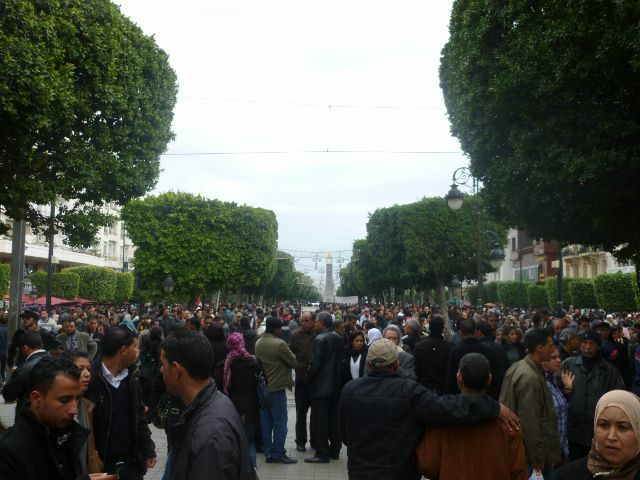 The uprising in Tunisia, as in many revolutions of the Arab Spring, was broad based. Support came not only from Bouazizi’s region, but from students, young people, the unemployed, and professionals from all walks of life. 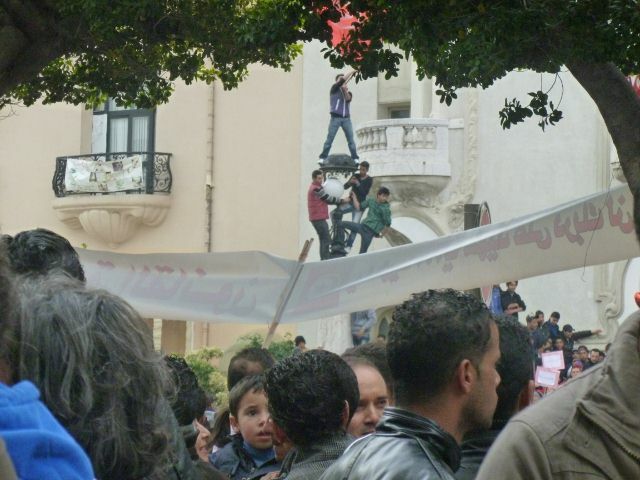 For both protesters and onlookers alike, Bouazizi reflected every failure of Tunisian society. Since independence, the first president of Tunisia, Habib Bourguiba, had emphasized education as the fundamental way Tunisia could modernize and prosper. Investment in education was seen by many as the governments most important social program and the ticket for Tunisians to a more prosperous life. With Ben Ali, economic liberalization and opportunity became the motto du jour. While Ben Ali nominally had the same philosophy as Bourguiba, his commitment to improving educational standards was suspect. In a country that used to see its doctors and nurses, engineers and businessmen in demand at home and in Europe, increasingly, Tunisian diplomas were not being recognized by European governments. Coupled with tighter immigration standards from the European Union, the release valve Tunisia had relied on to help check its demographic pressures was no longer available. Even educated Tunisians looking to emigrate could expect low wages and an unwelcome population on the other side of the Mediterranean. Many Tunisian universities were becoming diploma mills for degrees that were no longer in demand, while secondary education was not meeting a growing demand for skilled laborers, such as plumbers and welders. But it didn’t end with education. Entrepreneurs were increasingly punished under Ben Ali. If you ran a successful business, the family would demand ownership. If you were a taxi cab driver, your permit would be renewed only if you bought a car from a Trabelsi dealership. If you were a civil servant, you were obligated to take out loans from one of the Trabelsi owned banks. 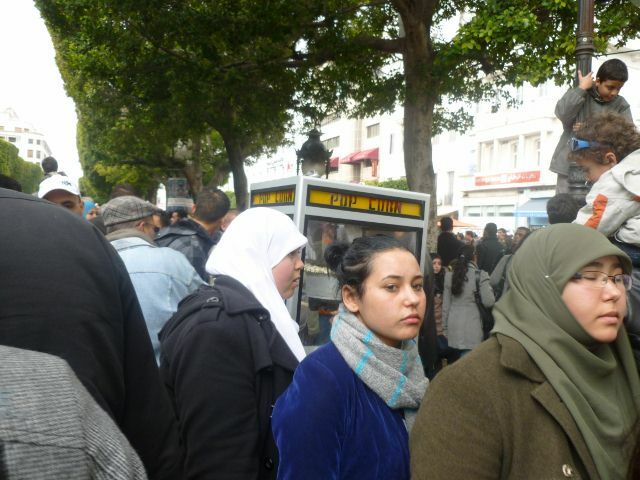 While the government touted economic growth figures, the average Tunisian increasingly felt marginalized. 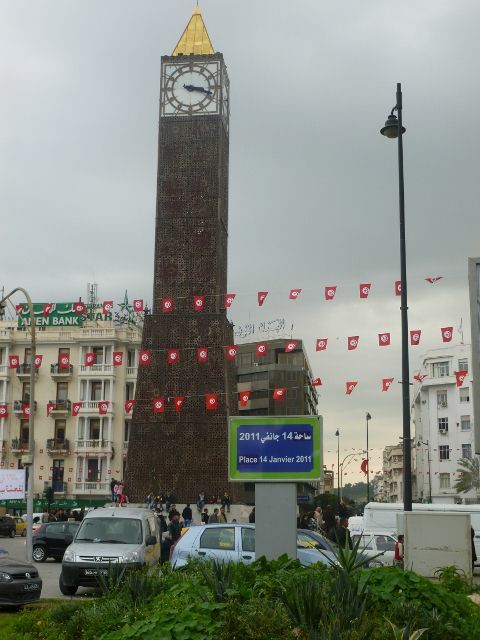 The two things the regime touted, education and economic opportunity were no longer the keys to success under Ben Ali. The social contract was breaking. Tunisians saw in Bouazizi a young man who had played by the rules of the game. He graduated from high school (some say university – though this part is unclear), a sign of his commitment to society and desire for employment. And yet despite his education, he was a fruit seller – a clandestine one at that. But even in this modest job – the police confiscated his stand and humiliated him. In this young society, less than 60 years from independence, even well-off Tunisians are rarely far removed from le bled – the country side. Bouazizi touched the hearts of a country that was seeing its sons and daughters play by the rules, submitting to Ben Ali’s strict authoritarianism, and still not being able to achieve economic independence. As protests grew throughout the month of December, the government cracked down and spewed propaganda. But it was all just a little too much. The paternalism of Ben Ali rang hollow. If he was so committed to the country, why would young men be humiliated and forced to such extreme measures as Bouazizi was? 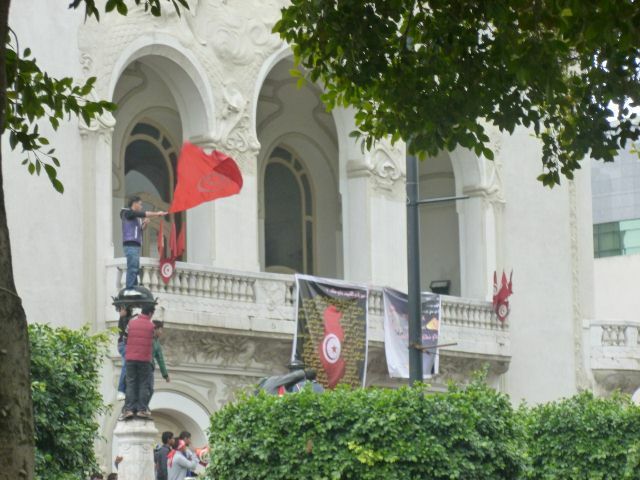 State controlled television portrayed the protesters as vandals and Ben Ali as the nation’s guarantor of stability. This contrasted with images and accounts of the police using live-ammunition against peaceful protesters. But while extensive censorship allowed the government to propagate this narrative, the story of Bouazizi kept spreading – and the government had no good responses. Bouazizi’s selflessness in the face of injustice was the recurring image Tunisians came back to. Of course it wasn’t Bouazizi that caused the uprising. 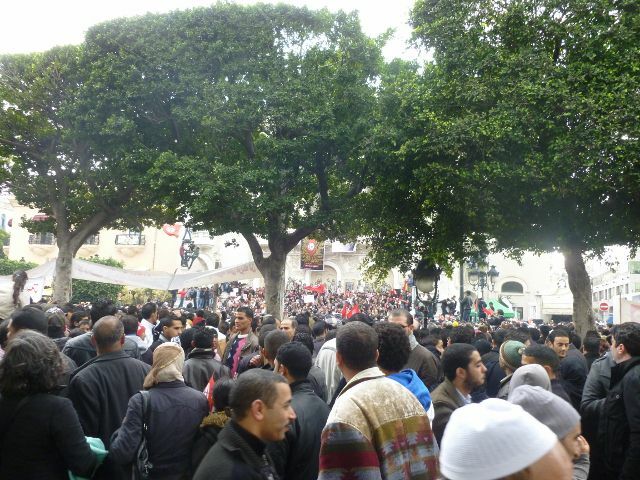 The Tunisian uprising was the result of years of struggle by all facets of Tunisian society. No where is this embodied more than in the two leaders of the new Tunisian government. Prime Minister Hamadi Jebali languished for 16 years in a Tunisian jail cell for his involvment in the Islamist party Ennahdha, while President Moncef Marzouki was exiled for most of his life for support for human rights and basic liberties. Behind these figures are thousands of activists who risked their lives over the years. However, Bouazizi was able to accomplish what no activist had been able to – he captured the hearts of Tunisians. Bouazizi brought home to every Tunisian the reality of what the Ben Ali government had become, brutal kleptocrats. Bouazizi represented the betrayal of Tunisia’s social contract by the Ben Ali regime. By exposing the regime for what it was, Bouazizi unleashed the energy of all the forces of Tunisian society, both the activists and non-activists alike. He was a real Tunisian, with real problems, and he could not take it any longer. Neither could the Tunisian people. On the occasion of this tragic event, there is a sweetness to know that Bouazizi’s tragic act was not in vain and will be remembered. The French have the Bastille, the Americans have the Boston Tea Party, the Bolsheviks stormed the Winter Palace. The Arab Spring, and Tunisia in particular, have Mohammed Bouazizi’s humiliation, self immolation, and the subsequent people’s revolt. 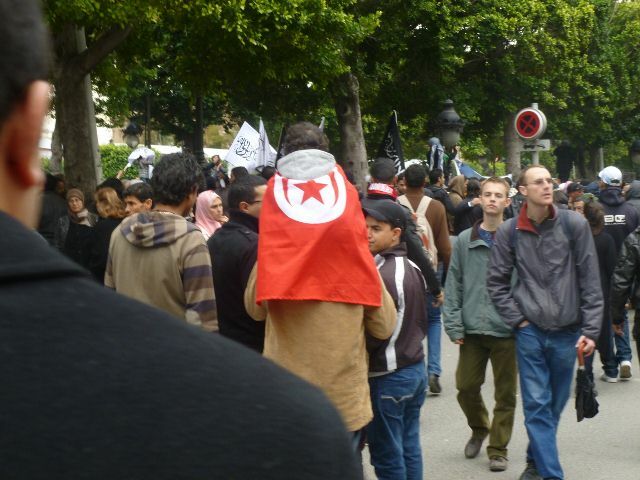 The famous revolutions in France, the U.S. and the Soviet Union were based on an idealized version of events and their implications – and so too, it seems, the Tunisian revolution. In a recent article (in French) in the French daily Liberation, Christophe Ayad, suggests that it is highly likely that the humiliation of Bouazizi was an exaggeration of events to help inspire other Tunisians. In particular, one of the key elements of Bouazizi’s story is that as he was peacefully selling fruits when he was approached by a female police officer. Lacking a permit for his stand, the police officer overturned his cart and slapped him. Ayad writes that the police officer incarnated the entire system that so many Tunisians fought against, especially in the restive center of the country, where gainful employment remains out of reach, especially for young men. His humiliation came not just from being slapped, but from being slapped by the pitiless autocracy – embodied by a woman – of all things. And yet, after the revolution as the officer was put on trial, the case fell apart. Two eyewitnesses recanted, another had such a grudge against the police his testimony was deemed inadmissible. Ayad spoke with a local union official in Bouazizi’s hometown of Sidi Bouzid, who described the actions taken against the regime long before anyone knew the name Bouazizi. And…..he admitted to inventing the whole story about the police officer, a ruse to get public support behind the unions movements. In Sidi Bouzid, Ayad reports, the Bouazizi name is not the one of heroes. His family has moved to La Marsa on the northern coast. But across Tunisia and the Arab world, he remains an inspiration. Obama’s recent speech on the Arab World mentioned him by name. And the slap itself was profiled on 60 Minutes back in February. History likes heroes and a good narrative. Bouazizi, whatever the story may be, fits our expectations of revolution and struggle against oppression. My guess is that the slap is here to stay.